The University of St Andrews Library Special Collections Division routinely commissions practical conservation of damaged material from Icon-accredited conservators. As part of the division’s policy on conservation, damaged collection items needed for teaching or research are prioritized for treatment. Before any interventive treatment is started, written condition assessments and treatment proposals are written by the conservator who will be doing the work. These reports are either done on an item by item basis, or batched in groups for more of a survey-type assessment. In this blog post Leah Humenuck, an MA book conservation student at West Dean College of Arts and Conservation, describes her work during a one-day site visit to Special Collections with Emma Fraser ACR to carry out condition assessment and treatment proposal reports for a selection of prioritized collection items. While interning at the Book and Paper Studio owned by Emma Fraser ACR (Dundee, Scotland), I had the opportunity to assist in performing a survey on some of the University of St Andrews Library Special Collections’ books intended for use by researchers. 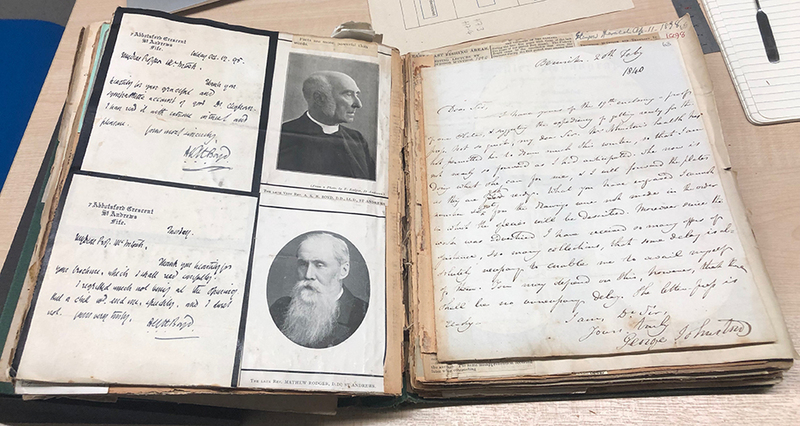 The purpose for this survey was to assess the items’ condition and to determine what, if any, conservation treatments were needed to bring the books into a state where they could be safely handled. This would allow the information to be gleaned by researchers without risk to the book itself. Once on-site, we were greeted by Erica Kotze ACR, the preventative conservator, who showed us to a table which held treasures of literature, photography, and book evolution. There was a wide range of sizes and shapes as well as ages in the selection, spanning roughly four centuries from late 15th century right up to the end of the 19th century. Included were limp vellum bindings, a copy of the Nuremberg Chronicle, scrapbooks, photo albums (including a French door photo album), among others. Performing surveys like this are a valuable glimpse into an enormous range of book structures and content. Due to the poor condition of some of the books, I was able to get a good look at their construction which, as an emerging book conservator, was a beneficial experience. In many ways being there was akin to being present in an old operating theatre, except the patients were books. In conducting the survey, we assessed the books for the inherent vices in both the structure and materials. Understanding where the weight was borne when a page was turned, how a board has warped, or even the shape of the spine are all pieces of insightful knowledge. Additionally, it was also important to note what had gone missing, what remained, and what may have been added to the book’s structure. All these aspects tell part of the story of the book’s material biography. Some personal highlights of the survey for me included an album with French door binding. As a book conservation student who has taken a particular interest in scrapbooks and album structures, I was delighted to see such a unique item. 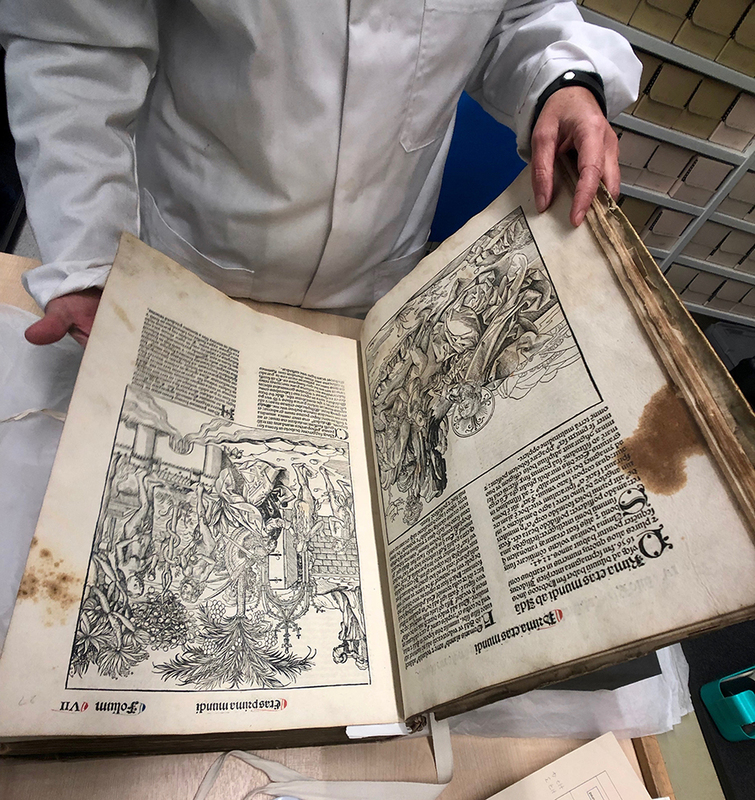 Also, recently we had a lecture on the history of printing where we were able to print from a replica wood cut of one of the illustrations in the Nuremberg Chronicle. In light of this, I was keen to soak in the experience of observing a copy of the book in person. And lastly, seeing a copy of Alfred, Lord Tennyson’s Idylls of the King and other Poems illustrated by Julia Margaret Cameron was a true treat since doing a course on the photographic book at Rare Book School. Considering the variety and quality of such a small sampling of the University of St Andrews Library Special Collections, I found myself wondering what other bookish treasures are to be found in this small town in Scotland. The Special Collection’s staff are diligent in ensuring the collections are both protected and available to both current and future researchers. I highly encourage researchers to explore the Library’s brilliant collection. Thank you to Erica Kotze and the University of St Andrews Library Special Collections staff, who were welcoming, and Emma Fraser, my internship supervisor, for inviting me to assist her. A fascinating account. I am interested to note in the first photograph though that the book is being handled sans gloves. Thanks for your comment. As a rule, we prefer clean hands to gloves. There can be a greater potential for damage to the book or manuscript when wearing gloves as gloves reduce your sensitivity to what you are handling. You can read more about the use of gloves on the National Archives blog here: https://blog.nationalarchives.gov.uk/blog/the-gloves-are-off/. Thank you for that useful information and for the links.